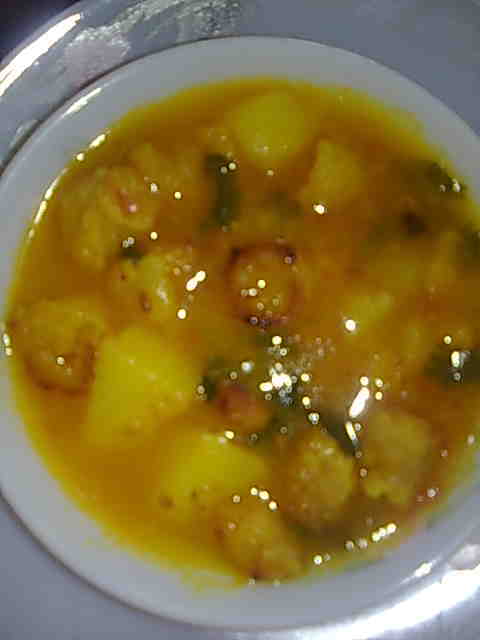 This potato and wadis made of split green gram dish is popular among Marwaris. They also make the wadis alone as a curry besides aloo mangodi sabzi. Women in Marwari community make these moong dal wadis or mangodi at home by soaking, grinding the dal and sun drying it. Wadis or badis are sun dried ground lentil dumplings. Readymade wadis are available at grocery stores. This is a healthy dish since you get vegetable and lentil in the same curry. 1. Heat 1 tsp ghee in a pressure cooker and fry mangodi till reddish brown. Take them out. 2. Mince together onion, ginger and garlic in a blender. 3. Heat rest of the ghee in the same pressure cooker and add cumin seeds. When they change color, add hing. Add onion paste and sauté till brown. Add turmeric powder, coriander powder and red chilli powder. Fry for few seconds. 4. Add tomato puree and fry till oil begins to separate. 5. Add mangodi, aloo and salt. Add enough water and close the lid of the cooker. 6. Let 1 whistle come, then turn the heat to medium and let it cook for 25 minutes. 7. When the pressure drops, open the lid of the cooker. 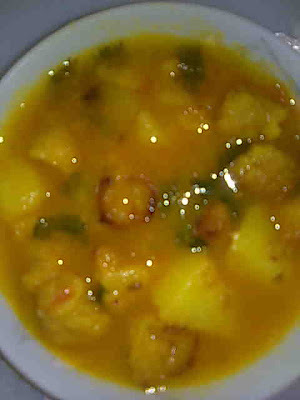 Transfer aloo mangodi ki sabzi to serving bowl and garnish with coriander leaves. Enjoy hot with rotis or parathas.